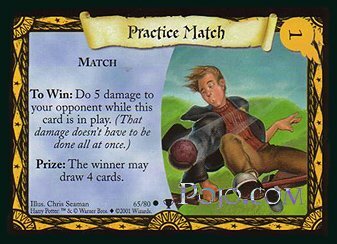 You and your opponent are wizards dueling at Hogwart's School of Witchcraft and Wizardry. Many cards you play will damage your opponent, which means your opponent has to discard cards from his or her deck. You win the game when your opponent's deck runs out of cards. Pick which deck you want. Both play your starting Wizard or Witch card on the table at the same time. Shuffle your deck and place it on the table faces down. Draw 7 cards from your deck for your starting hand. 1. Before you draw a card. If a card tells you to do something before your turn, do it now. 3. Your creature cards that do damage, damage your opponent now. Use 2 actions to play an adventures card. 5. If a card tells you to do something at the end of your turn, do it now. 6. End of your turn. Creatures damage your opponent's deck - and not other creatures unless their card states it. They stay in play after you play them. 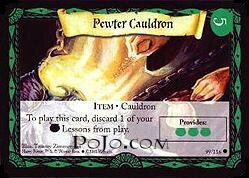 Power Needed: In one corner of the card, you will see a number and a lesson symbol. You must have this many lessons on the table to play this card, and ONLY ONE OF THEM HAS TO MATCH the lesson symbol. For example, Surly Hound has a cost of 3 'Care of Magical Creatures' (foot). 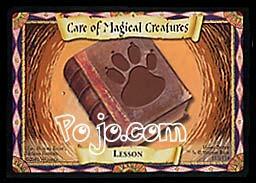 To play it, you'd need 3 lessons in play, and at least one of them would have to be a Care of Magical Creatures lesson. Damage Each Turn: Your opponent discards this many cards from his or her deck every turn. This damage happens on step 3 of your turn, so your creature DOESN'T do damage on the turn that you play it. Health: If your opponent's card does this much damage or more to your creature, discard it. Damage To A creature: If you do less damage to a creature than its health, you'll need to mark the damage somehow. You can use counters or markers of any kind. For example, if you have a creature on the table with 6 health and it takes 2 damage, put 2 counters on it. If it later takes 4 or more damage, discard it. To play a spell card, show it to your opponent, do what it says, and put it in your discard pile. Spells don't stay on the table like other cards do. Power Needed: You must have this many lessons in play to cast this spell card, but ONLY ONE OF THEM HAS TO MATCH the symbol on the card. Items are a lot like creatures. Once you play them they stay on the table (unless some card tells you or a condition is met to discard them). Some items (Wands and Cauldrons) give you extra power - just like lessons, but even better. Other items have all sorts of different effects. To play a match card, you need the required amount of power and you use up 1 of your actions. There can be only one match on the table In Play at a time. So if you or your opponent already has a neither of you can play another one. To Win: This is what a player needs to do to win the match. It does not all have to be done at once. So a player might win by doing some damage on each turn. (This means each player needs to keep track of how much damage he or she has done towards winning the match.) Also, either player can win the match. These represent different places in Harry's world. You'll find location cards for each different lesson type. To play a location card, you need the required amount of power and you use up one of your actions. When you play a location card, it stays on the table. Since you can be in only one place at a time, only one location can be in play at a time. When you play a location card, check to see if your opponent already has a location in play. If there is one, discard the old location from play. Adventure cards are a kind of card you can play to give your opponent a challenge to overcome. You don't need any lessons on the table to play adventure cards, but you do have to use 2 Actions to play them instead of 1. Each player can only have one adventure in play at a time, so if you already have an adventure in play, you can't play another one. An adventure card has three parts. Effect: This is what the adventure does as long as it's in play. To Solve: This is what your opponent needs to do to solve the adventure. They can do this any time during their turn after they have drawn their first card, but they have to solve the adventure all at once, not one piece at a time (unless the card specifically says otherwise). Opponent's Reward: If your opponent solves the adventure, they're the school hero! The adventure card will say what their reward is. Then you put the adventure in your discard pile. 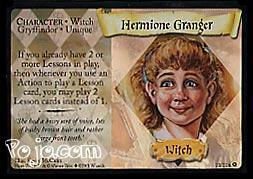 When you play the Harry Potter TCG, you always start with a character in play that represents you (this is your starting character). Your starting character is special in another important way: it can never be discarded from play for any reason. For example, if a card tells you to discard three cards from play, you can't pick your starting character as one of those three. As long as the game is still going, your starting character is there - because it's you! Using Other Character Cards: In the game, you can also have other character cards in your deck. Just like adventure cards, you play a character card by using up 2 Actions, and it doesn't matter if you have any lessons or not. Ability: Once you've played a character card, you can use its special ability. Whether it's the character you started with or one you played during the game, you can use the ability any time during your turn after you've drawn your first card. All character cards, and some other special cards, say Unique on them. This means there can be only one of them In Play at a time. There is one exception. If you and your opponent both have the same starting character that's fine. Otherwise, only one of each Unique card can be 'in play,' at one time. Nobody else can play another copy of that same 'Unique' card unless it has been discarded from play. Keep in mind that starting characters can never be removed from play. Also, this 'Unique' rule does apply to two different 'Unique' cards that represent the same character. 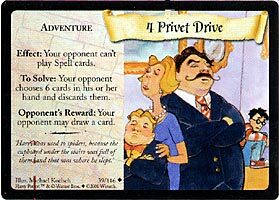 For example, if Harry the Seeker is in play, nobody can play Harry Potter, Harry the Seeker, or any other Harry Potter character card for that matter. 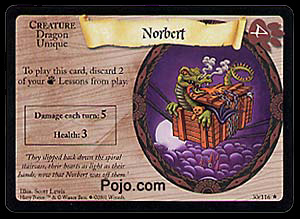 Some cards have special words on them that other cards, or the rules, refer to. These keywords come right after the type of card. 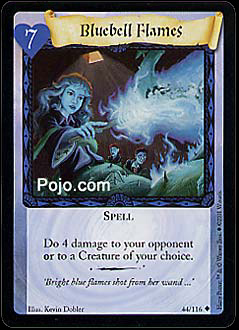 For example, the card Boil Cure has the keyword 'Healing' after 'Spell'. If some other card makes you discard all Healing cards from your hand, and you have Boil Cure in your hand, you'd have to discard it. For most keywords, everything you need to know is on the cards, but there are special rules for the Unique, Wizard, Witch and House keywords (Gryffindor, Slytherin, Ravenclaw and Hufflepuff). Other keywords are there for fun or for other cards to refer to. Your deck must have exactly 60 cards. You must ALSO have 1 card that's your starting character (which has to be a Witch or Wizard). So, you will have 61 cards total. Your deck can have, at most, 4 copies of any card, except for lesson cards (you can have any number of those). If you want, you can build a 'House deck'. This means that all the cards you choose are from a single House (Gryffindor, Slytherin, Ravenclaw, Hufflepuff or Pojo.com's House of Pain). Pick a House, and use cards that have keywords from that House or that have no House keywords at all, but don't use cards from any of the other Houses. Decide what kind of spells, items, and or creatures you want to use to beat your opponent. Try thinking of cards that would make a good combo or just work well together. Select a starting character that best supports your idea. Pick out your lesson cards and items you will need to support your deck idea. Keeping in mind what types of lessons you chose, fill in the remaining room with spells, items, locations, or creatures. Remember to add adventure or other character cards if you want to use them too. All you have to do now is take time playing out a few hands by yourself to see how it's working. Adjust cards in your deck by swapping out certain cards that you need to make your deck play the way you want it too. GOOD LUCK!